This year I decided to plant some veggies so that Mr. Wonderful and I could be more "self-sufficient". I planted green beans, tomatoes, carrots and strawberries. We live in a condo so our self sufficiency experiment had to be in containers on our back deck. The strawberries didn't make it because of Fudge the Squirrel digging in the pot. However, we did get lots of green beans and tomatoes! Anyway, thinking that the experts were just being particular I disregarded their advice regarding the planting of carrots. They said "Space the seeds evenly." They say "Once the greens are about an inch long start thinning them out." Don't they know how difficult it is to cull the little herd of cute green things you've planted and are growing? So the moral of the story: They are called experts for a reason. They know more about said subject and you should listen to them! 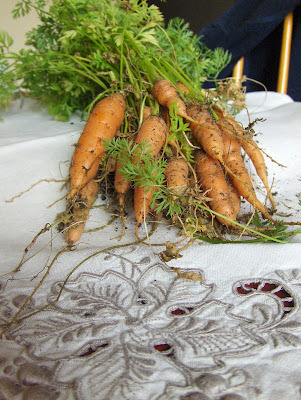 Next spring I am going to give carrots a try again and this time I will do my best to remember what the experts say. Green Hint: Take your used coffee grounds and spread them around the base of the plants. The plants love the Nitrogen and the animals do not like the coffee - silly things.